This lovely, highly developed, low maintenance wood boat will bring pleasure to you and your family for many years. The 24' Tyee is a dream come true, a modern, high-performance boat with the beauty of a classic. Powered by I/O, outboard, or inboard, the Tyee's extreme deep-V entry and warped plane bottom provide a comfortable ride through a wide range of speeds with sports car handling. Safety is assured by the strength of the epoxied stringer-frame construction. European hardwood plywood forms the hull sides and cold-molded bottom. This construction method produces an optimal hull shape, and an exceptionally strong and light boat. An economical and efficient boat to run, the Tyee attains speeds of over 40 mph with only 185 HP. Since each Tyee is built to order, the owner can specify the exact layout of the boat. 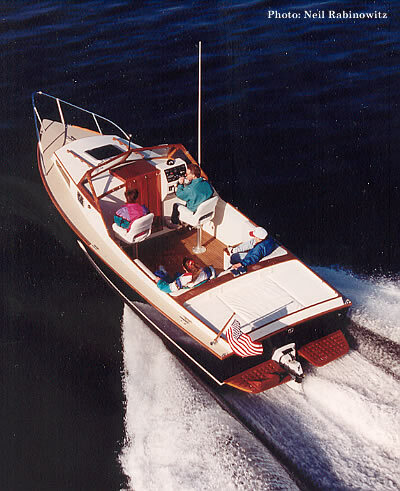 Options include a teak sole, a curved cockpit settee with built-in icebox, a stern deck for lounging that covers an engine compartment and two spacious storage compartments, swim steps, built-in fish boxes, downriggers, a cockpit table that makes the settee into a berth, or anything else your heart desires. Down below, the Tyee shows one of the great advantages of wood construction. The interior is finished bright to allow you to bask in the warmth of the mahogany panels. Since the interior woodwork is not exposed to sunlight, this beauty is almost maintenance-free. The 6'8" V-berth has an insert to make it a double, complete with Porta-Potti underneath. There are two cabinets with teak louvered doors, one cabinet for the stainless steel sink and fresh water system, and the other containing a two-burner alcohol stove. Ample windows keep the interior bright. The opening ports and forward hatch provide plenty of ventilation. Each owner picks fabrics and boat colors to keep each boat unique. Maintenance on this beauty is not a problem since the exterior is epoxy-coated and painted with linear polyurethane paint. Unlike gelcoat, LPU paints need no waxing to retain their gloss and beauty. We engineer each vessel to eliminate places where water is trapped so they are easy to clean. There is no danger of rot. The minimal exterior trim can be painted, oiled, or varnished. Each owner has a wide latitude in the choice of arrangement, equipment, and detailing. We encourage you to visit to our shop to observe your boat under construction. These are special boats for special people. A Tyee from Nexus can be the true expression of your needs, desires, and personality. After all, do you deserve any less?